If I could say there is one thing I absolutely dread doing with the children, it's taking them grocery shopping. I usually do anything to avoid this and will go when they are in school or order online. However due to the madness of the Summer holidays it's not always that easy and sometimes I just have to grit my teeth and take them! I would honestly recommend every parent tries this over the holidays. Our children absolutely loved being in charge and have been asking every day when we can do this again. I am confident they learned a few life skills too and budgeting for a family meal is not something they would normally learn in the classroom. 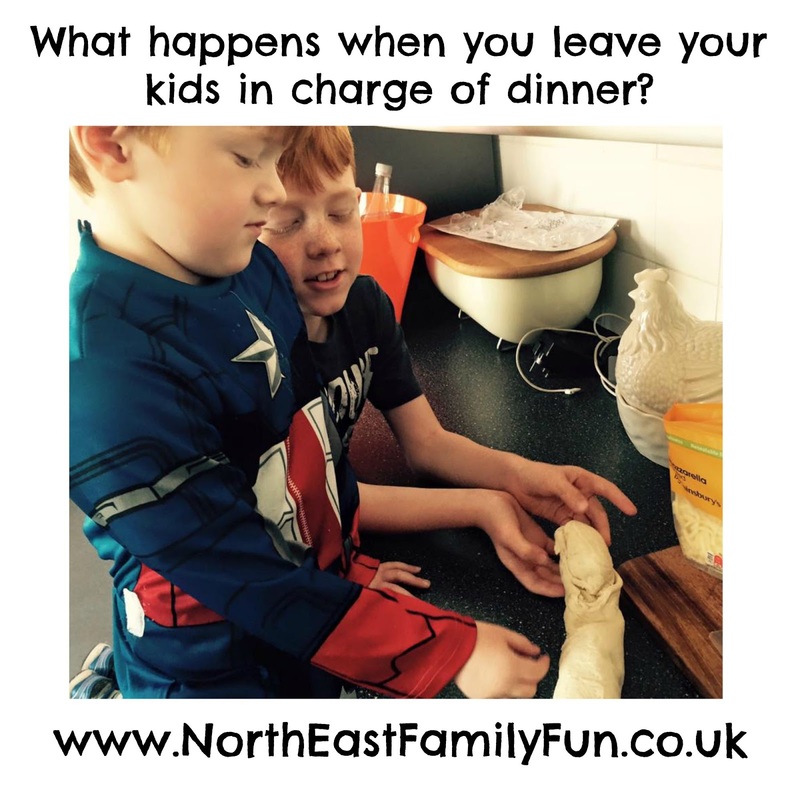 What did our 8 year old learn from being in charge of dinner? I was really surprised that Harry knew approximately how much we were paid and he could equate this to how much we spent on food. Unbranded products are usually (but not always) cheaper than branded products. Make sure you look on the top and bottom shelves where food is often cheaper. Sometimes there are leftover ingredients and it's a good idea to plan in advance what you are going to do with them so they aren't wasted. You can make three pizzas for £7.50. Tinned vegetables work out cheaper than fresh vegetables. Look out for special offers but make sure you check you are getting a good deal. We are delighted that Newcastle Building Society have given us a £50 Sainsburys gift card to giveaway to one lucky reader. Good luck and if you win, please let me know if you let your own children plan and cook dinner. Enter using the Rafflecopter below. Wow he did so well! A fantastic idea, I remember constantly nagging my Mum the whole way round the supermarket and sneaking things into her trolley when she wasn't looking! I would cook something easy that I know would be good, it would probably be something from a packet like Fish fingers, chips and peas followed by an apple crumble as that's quite easy to make. Well when I was young I loved fish fingers ...si much wanted them all the time...haven't had them for years...so would definitely cook fish fingers and chips and beans! What a great idea :) My 8 year old self would have liked chips in a burger I bet! Smiley Faces and Turkey Twizzlers haha. I think at 8 my fave meal was those really cheap packet noodles. Not super noodles as they are too saucy, the really cheap ones. Still is! Cheesy scrambled egg on toast! Spag Bol! Actually tried this when I was 8 - the pasta was like rubber! uhm it would be an arguement between my two as they both like different things! He would choose a roast she would choose cheesy pasta! I would cook spaghetti Bolognese, nice and simple. I'd cook Corn-on-the-Cob, Veggie Kebabs with Pitta Bread, followed by Fresh Berry Salad. chicken nuggets beans and potato waffles! I think fishfingers and chips would be my lazy option. Fish fingers, mashed potato, baked beans and jelly beans. Hey if I'm 8 then beans are beans right? I don't know the difference. If I was 8 years old I would cook chicken, chips and veg! That was my favourite!! Beans on toast with lots of grated cheese on top. If I was 8 I would probably just make toast with tinned spaghetti - not sure I could manage much else!!!! Baked beans on toast - nice and easy! Pizza or chicken dinosaurs and potato waffles. My eight year old takes after her father - both can only cook tacos, so if I were eight years old I'd follow their lead...I mean, who doesn't like tacos? Probably macaroni cheese, it was always my favourite! It would definitely be Fish Fingers and Waffles, my boys favourites. Probably ice cream on toast! I would probably make pizzas as well, my son always eats things better if he has helped to make it. Ham fritters and syrup sandwiches! I'd cook beefburgers in sesame seed rolls & chips. If I was 8 I would make baked potatoes with cheese and beans and Lincolnshire sausages because that is what I used to do when I wasn't much older! When I was a kid I lived with my granny and I mainly used the microwave for cooking as it was safer so I used to make baked potatoes in the microwave all the time. I also used do the sausages in the microwave too and they used to shrink horribly! They always came out half the size they went in! My kids have always loved making pizza.... or quiche. When I was 8, I would have loved to make fish fingers and chips. If I was 8 again, I would try to make bolognaise pasta bake, yummy. I think the 8 year old me would have sausages, mash, veg and gravy. When I was that sort of age it was meat and veg all the time and thats all I knew! Chicken Nuggets with ketchup. Still love it! Chocolate Pizza - what else! I used to do this with my children when we were going camping they would plan the menus (we went for three days) and buy the food at Lidls and do the tea while we were away. Probably macaroni cheese for me! Baked beans on toast probably! I think my favourite was alphabetty spaghetti on toast with some melted cheese on top! I'd make scrambled egg on toast. I would cook pasta as its so easy and cant really go wrong. Based on what I actually cooked at 8: small flat cakes with tea leaves in them - quite gross. Sticks of spaghetti poked through hot dog sausages with pasta sauce. At 8 it would be pudding. Maybe chocolate cake with mint custard. Probably a big plate of chips or beans on toast! I liked to cook and my Gran got me a kids cookbook, my fave was a toasted open faced ham sandwhich with shoestring potatoes on top so it looked like a hay stack. If I was 8 years old again I would probably cook a truck load of spaghetti with pasta sauce straight from the jar. Then whack it on a plate just in time for dinner. anything cold out of a packet!